The moose has long been an iconic image associated with Minnesota. These creatures used to be quite common in the northern part of the state, although a sighting is quite rare these days as significant numbers have died off in the last couple decades. Much like bears and wolves, moose remain elusive, mysterious, and an icon of Minnesota’s northwoods. Here are some statues commemorating them. 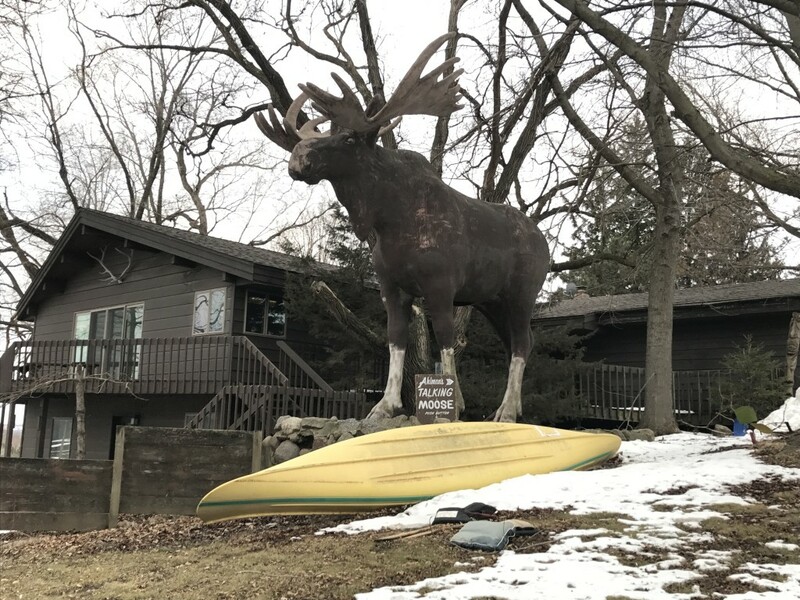 Honk the Moose in Biwabik, MN is life-size statue of a real moose who once took up residence in Biwabik over the winter. He even has a book written about him. He resides in the town park on the main thoroughfare through town. Learn more here. 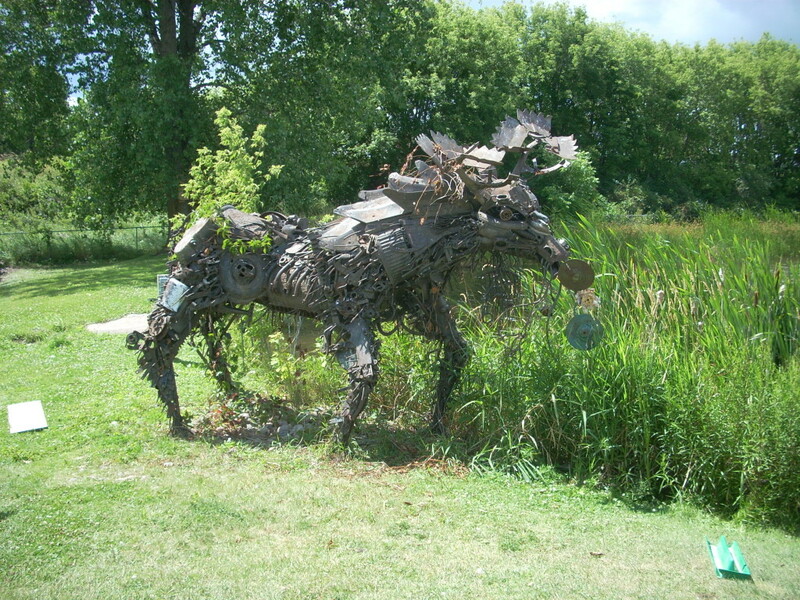 Frazee, MN, has a scrap metal moose on main street near a goose pond that was created by donations of local junk metal by sculptor Paul Epling in 1997. It looks angry, like it’s going to come to life at a moment’s notice and charge at you. It’s also an impressive work of art, very detailed and creative in the use of old bicycle parts, lawnmower blades, and other scrap. 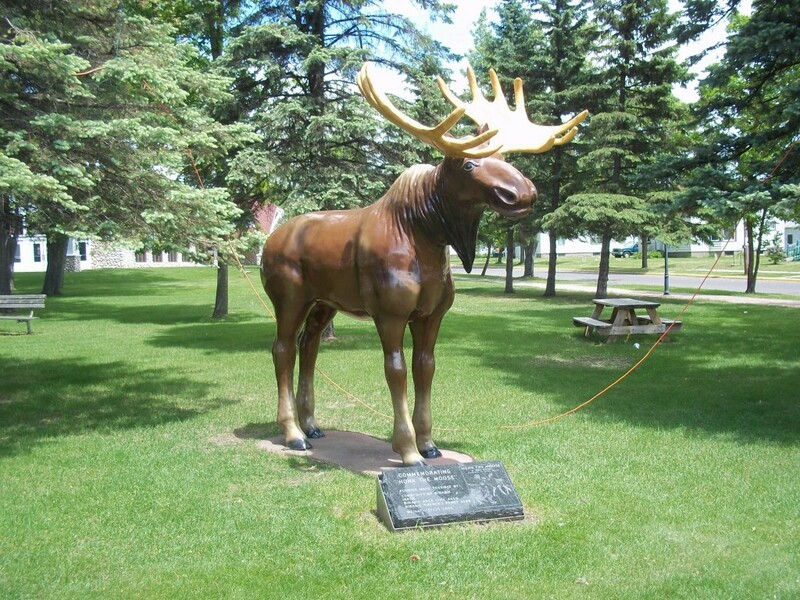 It would only make sense that there be a statue of a moose in Moose Lake, MN. This one has stood out front of the visitor’s bureau since 2003 after being moved from the prior location by the lakeshore of Moose Lake where the current Fallen Soldiers Memorial is located. According to the town officials, there is no “official” name but people tend to call him Maury the Moose. He was repainted by a local artist (Jon Lower) when the relocation took place. 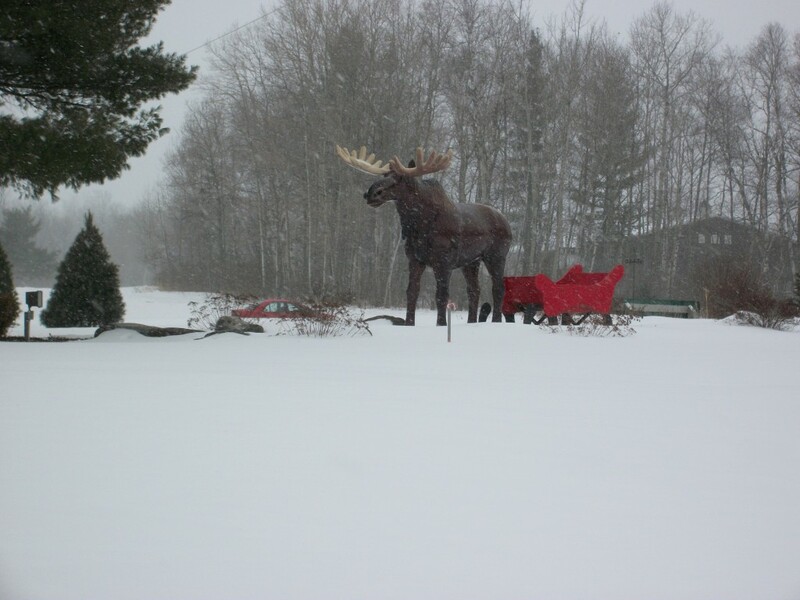 I was able to capture this one during winter of 2009, with the snow gently falling around him and a sleigh positioned behind him. Another interesting depiction is found in Grand Rapids, MN at an assisted-living facility outside of town. 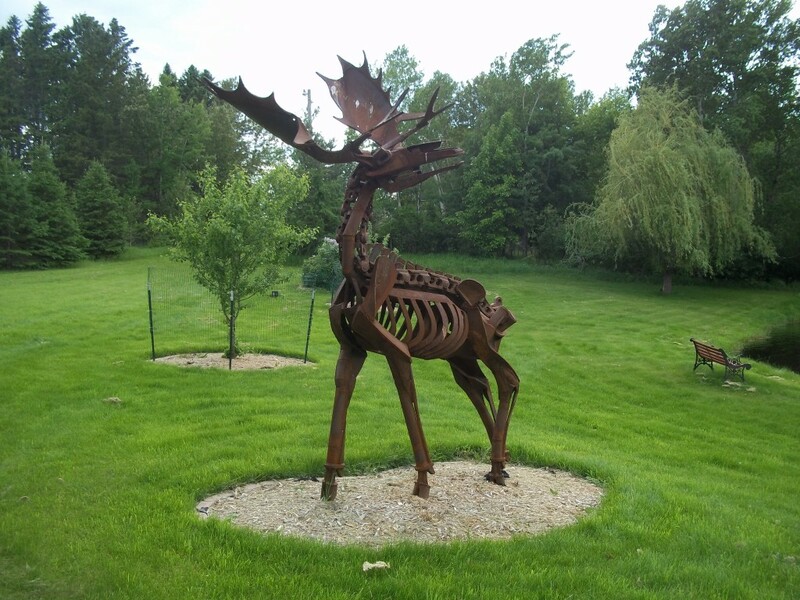 This Skeletal Scrap Metal Moose was created by Dutch artist Thijs Trompert of Amersfoort, Netherlands. He was built in 2012 and stands near a pond at the Garden Court Chateau. This one is about 20 feet tall and weighs a ton and a half. It was reportedly built in memory of the sculptor’s girlfriend’s grandma who lived at the facility. 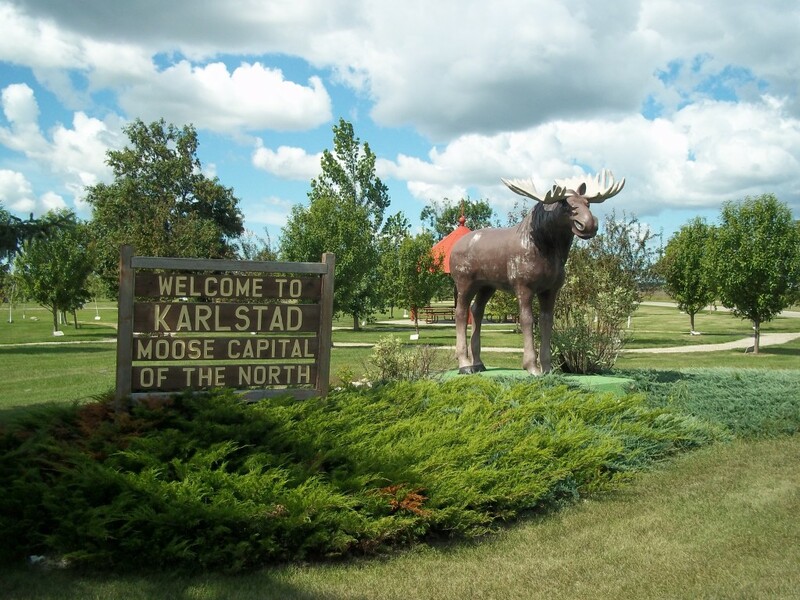 Karlstad, MN, in the northwestern part of the state, prides itself as the Moose Capital of the North. They also feature a 12-ft tall Moose statue in a park on the northern side of town. Karlstad isn’t far from Canada, and most people from here have at some point seen one wandering around. Karlstad is also awesome because it is my wife’s hometown. 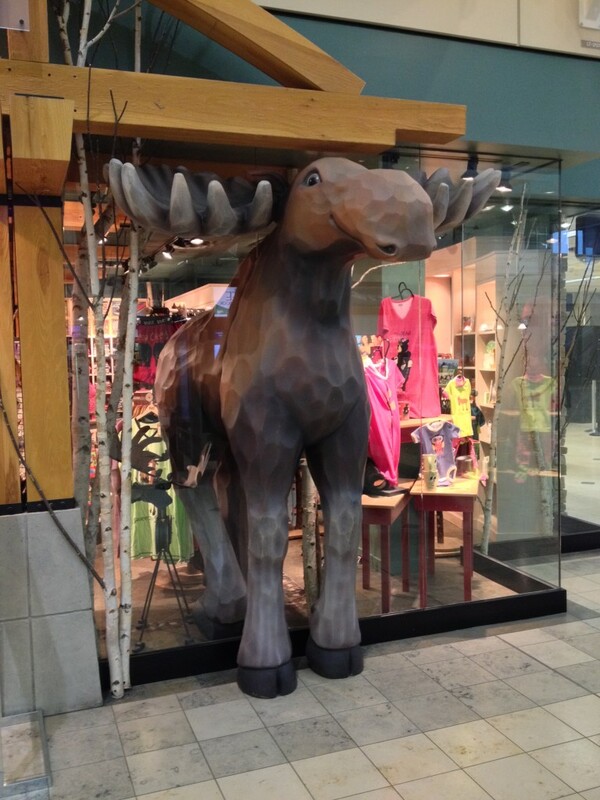 The Minneapolis Airport (MSP) also features a couple of gift shops that feature big cartoonish moose statues in the storefront in Terminal 1. Another Moose is found in Morristown at Ahlman’s Gun Shop, one of the largest gun shops in the Upper Midwest. Ahlman’s also features a re-created Old West town, complete with a Sharp-Shooter’s Festival every August. 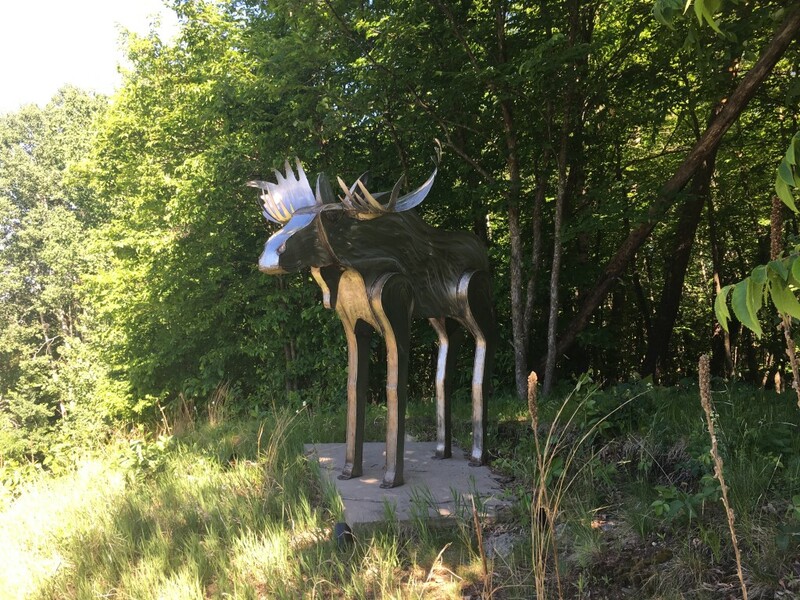 Outside of the beautiful resort-town of Breezy Point near Pequot Lakes, there stands a stainless steel moose, created by Jeff Kreitz of the nearby Creative Steel Works. 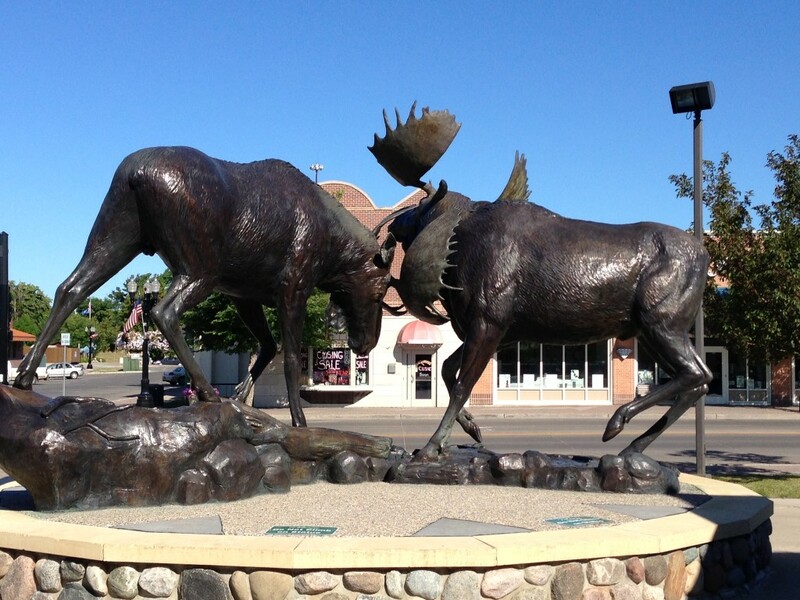 And lastly, two different sets of moose statues are located in East Grand Forks, MN: a life-size pair of bronze moose duking it out in front of Cabela’s. 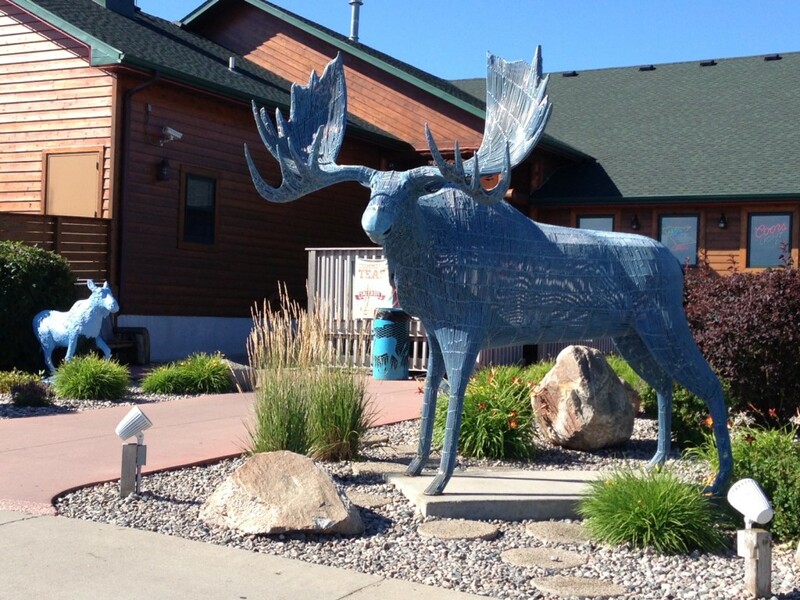 Titled “Northern Challenge,” the sparring moose sculpture was built by Eagle Bronze, Inc. in Lander, Wyoming and has stood in front of the store since 1998. And just steps away from the Cabela’s moose statue are a bull and calf moose, painted blue, in front of the Blue Moose Bar & Grill. The Blue Moose has been a mainstay in East Grand Forks since it first opened its doors in 1994. Even the devastating flood of 1997 couldn’t keep the place down. Even though moose sightings are becoming more and more rare these days, it’s still an amazing sight to see one of these majestic beings in the wild. They remain one of North America’s most fascinating and elusive creatures. Unless you’re in Alaska, then you probably see them pretty regularly. But if you need your fix, just head to one of the aforementioned towns for the next best thing! 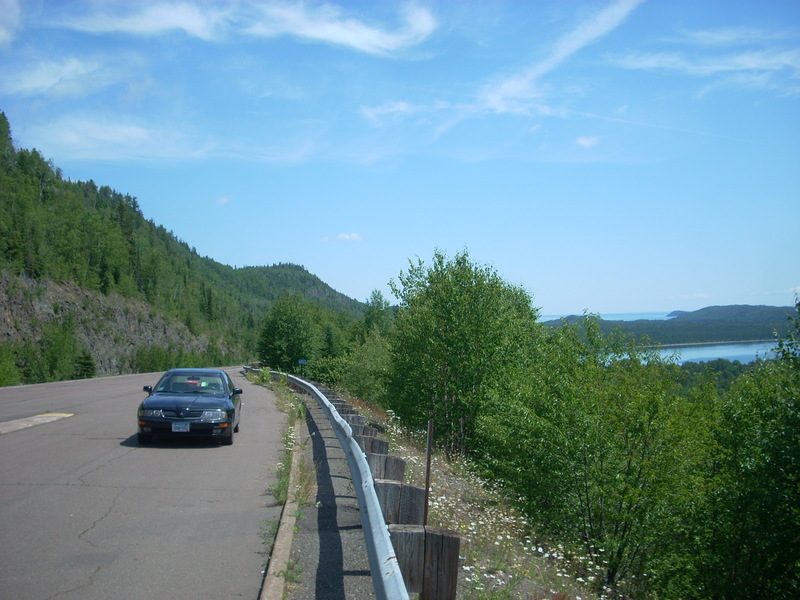 This entry was posted in Highway Highlights and tagged MN, Moose, Roadside Attraction by Seth5544. Bookmark the permalink.